Passengers on some of the UK's busiest rail routes will have access to internet speeds ten times faster than those currently on offer, under plans to upgrade the network. The £90m scheme proposed by the government will allow passengers on trains into London, Brighton, Bedford, Kent Portsmouth, Sheffield, Manchester and Leeds to connect without a charge. Funding for the plans, which could yield faster speeds in 3-4 years, will come partly from a penalty imposed on Network Rail for missing punctuality targets. Transport secretary Patrick McLoughlin said: "We all know how frustrating it can be to have our phone calls and internet use constantly disrupted by poor signal while travelling on trains. "At the moment it happens too often. 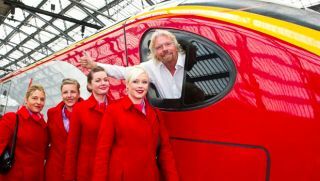 Passengers expect and deserve better and with these plans, that is what they'll get." While free, fast uninterrupted Wi-Fi on trains seems like a great idea to us passengers, the RMT union thinks spending money in this area instead of upgrading the lines could result in more travel frustration. The union's acting general secretary, Mick Cash, said: "The public need to be aware of the brutal fact that the … performance fine expected to be levied on Network Rail this week will come straight out of safety critical maintenance and renewals budgets and diverted into the pockets of the greedy private train companies to finance Wi-Fi services on their trains. "Safety and reliability on the tracks will be compromised with the rip-off train companies once again getting a free ride. This is a total con trick instigated by the government that will come back to haunt the travelling public."